I’ve never been really sure how to feel about New Year’s resolutions. There’s nothing like making yourself resolve to do something to take the fun out of it, which is why I really can’t bring myself to make any resolutions about my knitting. Not sure about the rest of you but this has just been the craziest week on top of an already crazy month! The kids are almost finished with school and it’s been a scramble to get as many things done as possible so that (hopefully!) next week can be a relaxing one with family (and my knitting!) leading up to the big day. In theory, I’m even going to spend all day tomorrow just knitting, uninterrupted. We’ve been chatting over on our Facebook page about what last-minute gifts people have on the needles and aside from one extremely fast knitter who is having a go at getting a sweater finished, most projects seem to be small, portable – and manageable! – accessories. I thought it might be helpful to share some cheeky tips, and pattern suggestions, in case you’re feeling up for a challenge with only a week to go before the man in the red suit comes for a visit! Remember the book that I talked about back in this post, and the contest that publisher Harper Collins was having to win a hamper full of crafty goodies in time for the holidays? 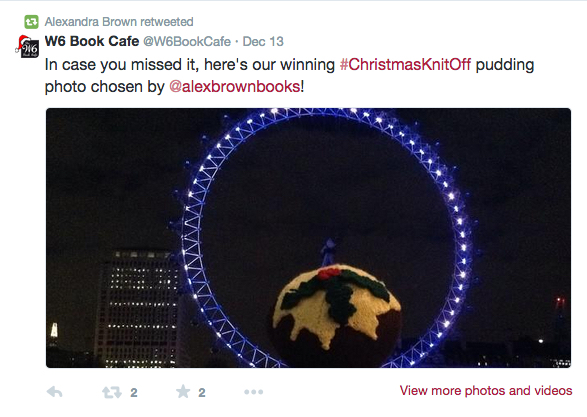 I think the winning snap is genius – the blue lights from the London eye remind me of the flames that burn off the pudding! A quick search of the contest hashtag #ChristmasKnitOff showed that lots of people were getting creative with the Christmas puds! My own was knit with Jamieson’s that I stuffed with lavender – thinking it would be a lovely little something to store in amongst my yarn after the contest was over. Of course, after the pudding being paparazzi’d everywhere I’m now thinking that I should have stuffed it with some Christmas spices (to make it smell like a real Christmas pudding, of course!) and added a loop to hang it from the tree. Oh well, the kids were quite taken with it so maybe I’ll do that with the ones I’m knitting for them! The book itself is an enjoyable, fun read. I was also relieved to discover that my namesake in the book is a keen knitter…! But I’m not revealing any more than that, save that I’d love the opportunity to visit Hettie’s House of Haberdashery in real life. The Great Christmas Knit Off was nice and light, and perfect for curling up with over the holidays once all the hullaballoo has died down. Alexandra Brown, the author, has said that there will be more craft-themed books to follow this one, which is great news. If you haven’t had had time to read the book yet, now’s your chance to win a copy – autographed by Alex too! Please leave a comment on this blog post with your favourite Christmas tradition that you’re most looking forward to this year. Be quick though – this contest is only open for 24 hours and will end at 10:59am GMT on Tuesday, 16 December. I’ll draw the winner and notify them right away so that I can get the prize in the post. No guarantees that it will make it to you before Christmas though! PS – Alex – it was an honour to introduce you to Ravelry. 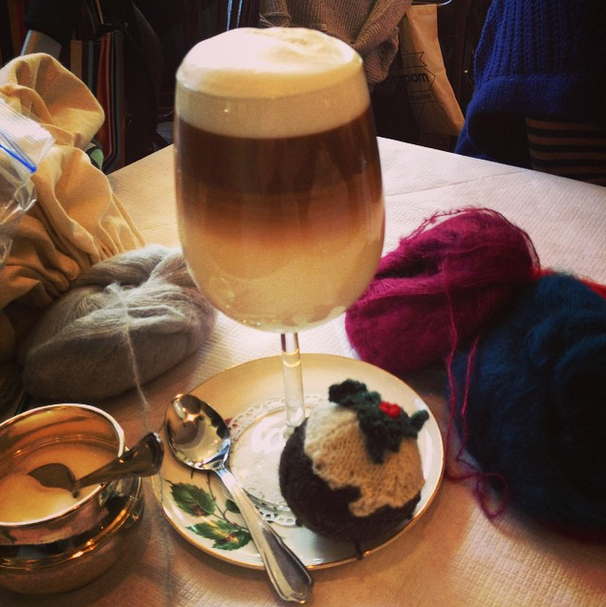 This post is for knitting designers, online shops and platforms. If you’re a knitter, read this post instead. Quick reminder: this legislation affects anyone who sells a knitting pattern download into the EU, regardless of where in the world your business is based. Sell one download to the EU after Jan 1st, and the sale should be taxed with VAT in the EU. The tax is based on the customer’s location. For an introduction to the changes in the legislation, see Part 1. Information for designers on Ravelry is in Part 2. I’m sorry, this post isn’t about fluffy cashmere or pretty knitting either. 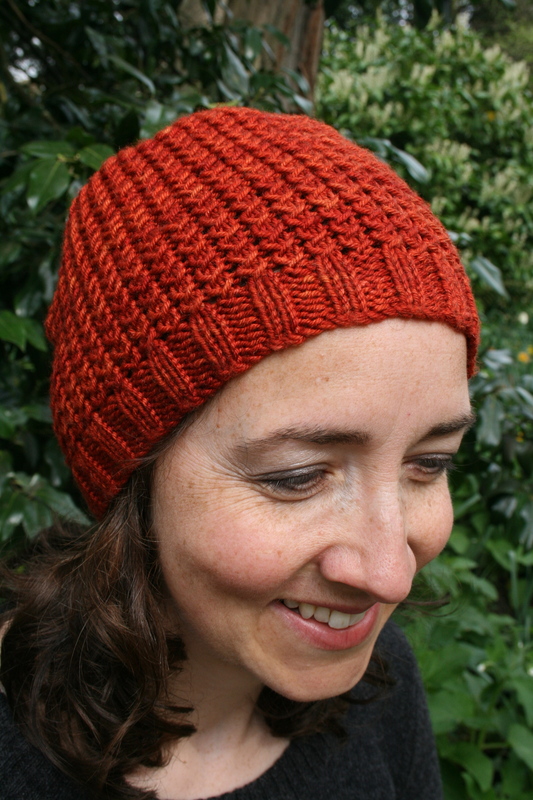 This post is for designers selling their patterns via Ravelry. If you’re a knitter and want to know about changes to EU VAT legislation, read this post instead. It’s more important than you think. For an introduction to the changes in the legislation, see my previous post, Part 1. In this post I am going to discuss the options available to designers using Ravelry, when selling to customers in the EU after January 1st. I’m planning another post to cover reporting EU VAT via the MOSS portal. Do nothing. Keep selling to the EU on Ravelry as if nothing has changed. Keep selling on Ravelry but report the VAT on EU sales yourself. Divert EU sales to another website e.g. your own website so that you report VAT yourself, or to another platform that will report the VAT. Block sales to EU customers (last resort, gulp). First off, a disclaimer: Seek professional advice. This is not professional advice. Discussion on an internet forum is not professional advice either. Until the first submission dates for tax returns pass, and people fail to remit their VAT, there is no case law. Get your own advice from your own tax office, lawyer or accountant; whatever you need to allow you to sleep at night. I am not liable for any action or inaction on your part. It is up to you to open this can of worms and take a good look inside. Then make up your own mind what you need to do. I got involved in this topic because I was concerned about the legal threat to Ravelry, and all our collective design businesses, of ignoring this legislation. To say that we have received conflicting advice from EU tax offices, politicians and pundits over the last few months is a gross understatement. Officials seem to have been as poorly briefed as us. In addition, things are changing so fast that this post may be out of date before I’ve even published it. What’s happening on Jan 1st? Digital services – such as your knitting pattern downloads – will be taxed with VAT in the EU. Reading this in the EU? You can expect to pay around 20% extra in VAT on many of your pattern downloads. You need to read this, painful though it may be. Not in the EU? Read-on too, because other countries are working on similar changes to how the Wild West of the internet is taxed. You can be sure that your government is watching this with interest because millions of dollars of tax are at stake.